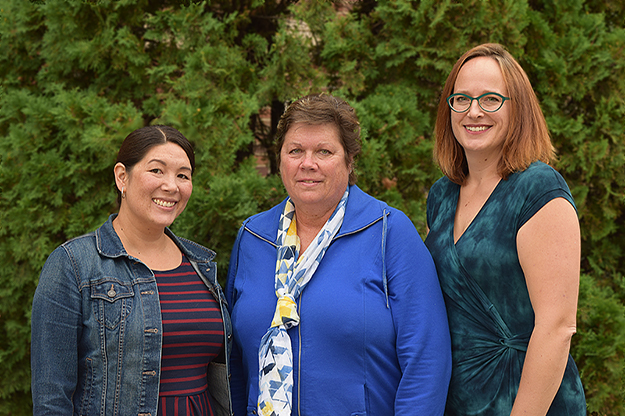 Casey Ozaki, Gail Ingwalson and Melissa Gjellstad, UND’s newest Faculty Fellows, working with others within TTaDA (Teaching Transformation & Development Academy, will collaborate with Colleges and departments to provide professional development and implement High Impact Educational Practices, including writing-intensive courses, undergraduate research, internships, capstones, diversity and more. Photo by Dima Williams/UND Today. There’s a teaching transformation under way. 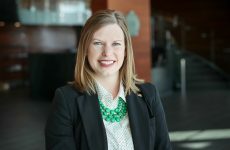 As the campus enacts the One UND Strategic Plan, three new Faculty Fellows will serve as resources and spark the drive to enhance teaching, increase student retention, and promote lifelong learning and professional development. The ultimate goal is to improve student learning and success, said Lynette Krenelka, executive director of the Teaching Transformation & Development Academy (TTaDA), which will host the Fellows. 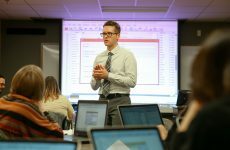 “It’s a one-stop shop for faculty,” said Krenelka. “We want to promote deeper learning, encourage a positive attitude to learning, and increase student retention and graduation rates.” She added that the Academy will address the Strategic Plan’s Goal 1, strong liberal arts foundation, Goal 2, increase retention and graduation, Goal 3, deliver opportunities online and on campus, and Goal 5, promote an inclusive campus. Along with that, the Academy will offer development for staff members. The new Faculty Fellows, working with others within TTaDA, will each lead specific initiatives tied to the Strategic Plan, she said, adding they will work with colleges and departments to provide professional development and implement High Impact Educational Practices (HIPs). Those include writing-intensive courses, collaborative projects, undergraduate research, internships, capstones, diversity, and more. Proven to benefit college students, they also will change the ways that faculty and students interact. That’s where the Faculty Fellows come in. Melissa Gjellstad, associate professor of modern & classical languages & literatures, will work with the Academy as the Faculty Fellow for Essential Studies. She will support faculty and departments as they improve on-campus and online Essential Studies courses related to diversity and inclusion. Gjellstad will support faculty who are designing courses that incorporate the new ES requirements to deepen student intercultural knowledge and skills. “I want to advocate for liberal arts and a commitment to student learning around the Essential Studies goals,” Gjellstad said. Casey Ozaki, associate professor of education, health & behavioral studies, is the Faculty Fellow for Inclusive Excellence. She will assist and support faculty and departments as they integrate diversity, equity and inclusion into their courses, program curriculum, and overall teaching. Ozaki said the appointment as a Faculty Fellow will allow her to apply her research and teaching expertise. She studies college student persistence, retention and development, and teaches graduate courses in higher education assessment, teaching and learning, and diversity. Her projects will include presentations, workshops and outreach, along with data analysis. Gail Ingwalson, associate professor and associate chair of teaching & leadership & professional practice, TTaDA Senior Faculty Fellow, will lead and mentor. “I’m excited about anything to do with improving teaching,” said Ingwalson. She served in the initial group of Faculty Fellows last year, is a former department chair, and was on the leadership team which reorganized the College of Education & Human Development several years ago. Ingwalson has a passion for teaching and the skills to pull together a variety of units, said Krenelka. Ingwalson visited with deans to learn more about their needs, and as a result will organize training customized to the needs of each college, along with a May curriculum development workshop for faculty to integrate High Impact Practices in courses that can meet the Essential Studies Intercultural Knowledge/Skills learning outcomes. 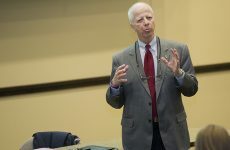 “High Impact Practices are different from one college to another,” Ingwalson said. “We will support faculty with new approaches and ideas. I believe faculty enjoy teaching more when students are engaged. These new ideas benefit students and learning and improve retention.” She added that some programs will focus on meeting the needs of staff members. 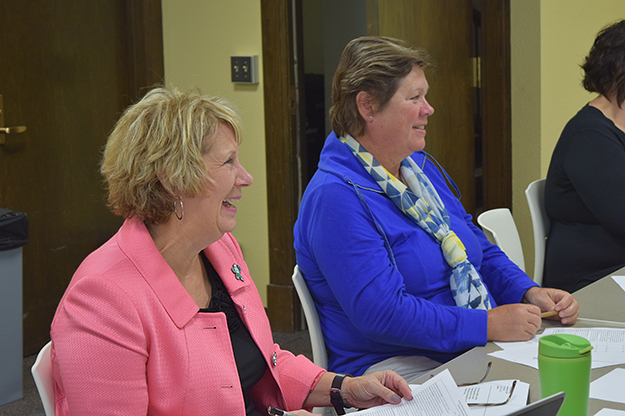 Lynette Krenelka (left), executive director of UND’s Teaching Transformation & Development Academy, says the ultimate goal for the three newly named Faculty Fellows, including Ingwalson (right), is to improve student learning and success at UND. Photo by Dima Williams/UND Today. The Teaching Transformation & Development Academy began in 2016 as an idea to unite faculty and staff support units. It brings together the office of extended learning, instructional design & digital learning (previously CILT), faculty and staff development (previously the office of instructional development & learning & professional development), and the writing center.